Temple of the Ancestor Moths is a settlement and chapel far north of Cheydinhal. 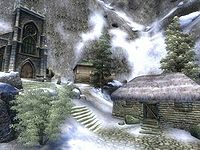 Located in the Jerall Mountains, this temple is the home of the Moth Priests, who are the only ones allowed to study the Elder Scrolls. As reading the scrolls progressively makes you lose your sight, the now-blind priests live their life of leisure at the monastery, tending the Ancestor Moths, harvesting their silk and spinning it into bolts of cloth. There are three monks maintaining the outside area of the settlement, while the priests and prelates live in utter darkness in the secret catacombs. You will come here during the Thieves Guild quest Turning a Blind Eye. 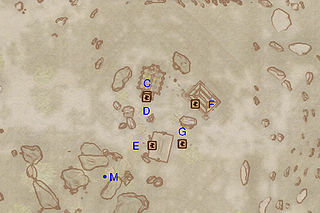 The settlement consists of the Monk's Quarters, the chapel (Temple of the Ancestor Moths), and the Ancestor Moth Crypt, the latter leading to the Catacombs. This is where the three monks serving the retired priests reside. While the quarters are locked at all times, breaking and entering is not considered trespassing, all of the items can taken without penalty, and the two double beds are free to sleep in. Not surprisingly, there is plenty of yarn and cloth to be found in the quarters, as well as some finished upper-class clothing, a pair of green silk garments and a green brocade doublet. In the northwestern corner, a set of shelves holds a pumpkin, a watermelon, and a rare copy of Pension of the Ancestor Moth. Three potatoes and a slice of boar meat can be found on the nearby table, while another pumpkin sits on the floor next to the fireplace. The humble dining table only holds three pieces of food: a cheese wheel, a bread loaf, and an apple. The quarters only contain three containers: a set of drawers, a chest and a crate, all non-respawning and containing clutter. The small chapel contains little of interest but is used by the three monks every day. 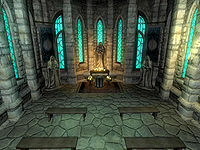 Three statues watch over the four benches in the chapel room, while the active altar is surrounded by lit candles. Behind the altar is a copy of Pension of the Ancestor Moth. Near the door is a ladder leading onto the roof of the chapel. During the related quest, it is not possible to speak to the monks while they are praying. This crypt serves as the entrance to the secret catacombs where the blind priests and prelates reside. The crypt is visited by Brother Holger every day and is locked at all times. It contains very little of interest as the only usable objects are a roll of cloth and a barrel with three torches. Turning a Blind Eye: Steal a stone for the Gray Fox. Due to a serious bug which can break the Thieves Guild quest line, it is highly recommended to avoid the crypts before initiating Turning a Blind Eye. For further information, see here. Esta página foi modificada pela última vez à(s) 22h56min de 12 de março de 2014.